Tampa Bay continues to be the most interesting team for me. 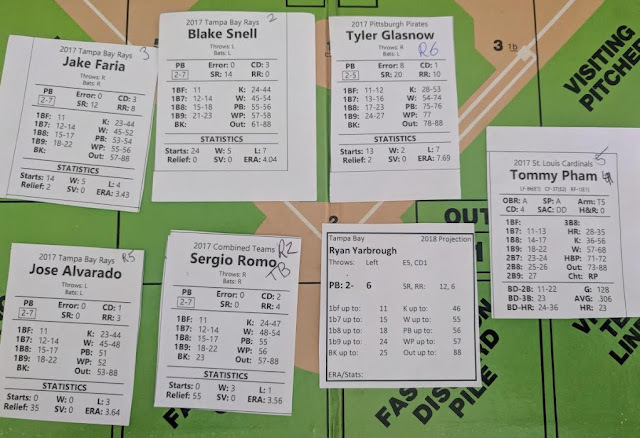 In real baseball, they continue to play above .500 baseball using their "no true starting pitcher" rotation despite unloading one player after another. 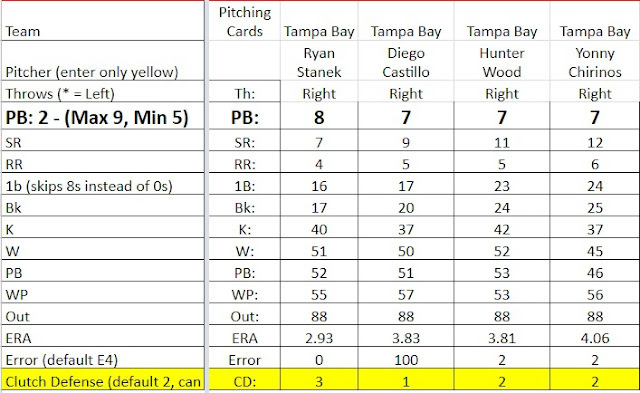 Their four new pitchers who have blossomed in this system between three good (PB of 2-7) and one great (PB of 2-8) new pitchers in the new cards generated from the google sheet and displayed below, to the pickup of the fascinating Tommy Pham to see if they can survive games against Detroit and Texas to survive our culling of the AL Statis-Pro season from 15 to 12. While I cannot really give Diego Castillo and Error rating of 100 (E0 is perfect and E10 is the worst), I did laugh to see in 27 innings pitched he has fielded one ball, and he made an error on it for a 0.000 fielding percentage. Below is the rest of the Rays "pitching by committee" team that includes for other good (PB 2-7) pitchers including two left-handers to give some mix and match through the crucial games. Meanwhile Tommy Pham (who actually just fractured his foot but hopefully is back soon) is one of the few ever Vietnamese players (half African-American) to make the majors, learned in 2009 he couldn't track the ball due to keratoconus and corrected it to become the only St. Louis Cardinal ever to hit .300 with 20 doubles, 20 steals and 20 homers last year - Hall of Famer Craig Biggio stats. The Los Angeles Angels will be one of the 12 teams to make the next stage of the AL Statis-Pro season despite being even more disappointing in Statis-Pro than they have been on the real field. The Toronto Blue Jays went from 13-23 to 13-29 through a shellacking by Arizona after trading AWAY four PB 2-7 pitchers and needing to rely on a bunch of poor (PB 2-6) pitchers. The truly elite pitchers are PB 2-9, while the truly awful are PB2-5. That leaves the Rays to play Detroit and then Texas and here are the scenarios for those three. 1. Detroit is eliminated unless they win by at least five runs to claim a three games to none sweep and improve to 18-27. They are relying on Mike Fiers, who is 50th of 51 starters with a 1-8 mark and 8.33 runs against average (see all 51 here). 2. Tampa Bay then plays Texas, who likewise can only stay alive if they sweep to go to 18-27. If both Texas and Detroit both swept they would play each other with the winner advancing. 3. Tampa Bay advances in most scenarios. If they avoid a 5-run loss both times they are in even if both are losses. If they lose by 5-runs to one of the two teams, but win the other game by 5-runs they are in with a 17-25 mark that would be percentage points better than the team that swept them (18-27 in that case). If the Rays advance they will continue to compete for the AL East with the very strong Yankees (27-15) and Red Sox (25-17) teams, as well as an Orioles team that played well above expectations (21-21) in Statis-Pro but lost Manny Machado to the Los Angeles Dodgers. If Detroit or Texas advance they will play in this AL East just to keep teams balanced. AL West: Houston 28-14, Seattle 23-19, Oakland 21-21, Los Angeles 17-25. AL Central: Cleveland 28-18, Chicago a surprising 22-20, Kansas City 19-23.